Courtesy of Ryan Goad, London Marathon Events. Great Britain’s Jack Burnell is the fastest open water swimmer to never medal at an Olympics or World Championships. The lack of medals led to a period of soul searching and positive outcome; that the Loughborough University graduate decided his talent is best demonstrated in the open water. 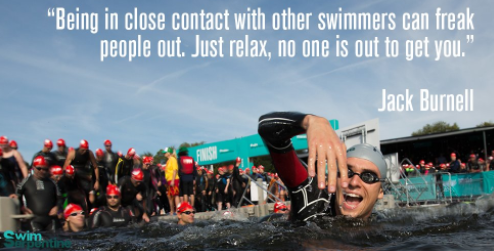 After a self-imposed break, Burnell will return to action at Swim Serpentine on September 16th with a focused determination to replace his close friend Ferry Weertman as the dominant open water swimmer on the planet. While the 24-year-old Burnell has been stewing, Weertman has been hot with a gold medal in the 2016 Rio Olympics and the 2017 FINA World Championships in Hungary. “I was unsure if I’d carry on after Rio and I was unsure again after this year’s World Championships. I was in the best shape I’d ever been for the World Championships and one bad decision cost me. Burnell was fourth behind Weertman in the FINA World Championships. He was happy for his friend out of the water. “Ferry is one of my best friends in the sport. He is exceptional at what he does. We are both very similar: we both have a very fast finish, but sometimes the luck has come down on his side. I’m looking forward to showing him my neck of the woods [in London] after the race. I’m not sure what sort of condition we will be in for the race. I have now [only] swum for a few months so I’m not expecting too much from myself and Ferry has had time off too, but I’m looking forward to Swim Serpentine. Pepijn Smits and German Olympian Andreas Waschburger will also give Dutch gold medalist and his rival some stiff competition. For more information on the Swim Serpentine where swimmers from 27 countries will compete in the Serpentine in London's Hyde Park, visit www.swimserpentine.co.uk. The festival includes half-mile, 1-mile and 2-mile waves and elite races for men, women and para athletes and feature the new London Classics challenge (Swim Serpentine + London Marathon + Prudential RideLondon-Surrey 100).